The name “Dutchman” is a hallowed one in the sports world. In baseball there was John Peter (Honus) Wagner; in football there was the volatile Van Brocklin; and in basketball there is our own Alvin J. Van Wie, Jr.
Our Dutchman was born in Schenectady, New York, played the usual scholastic sports at Nott Terrace High School, and then served two years in the U.S. Navy. He entered The College of Wooster in the fall of 1948 and played some football en route to a degree in physical education. After graduation he served as assistant football and basketball coach at Macelona, Michigan and head football coach at Evart, Michigan. Following a year at Toronto, Ohio, he returned to Michigan in 1958 where he was head coach at Petoskey. In 1959, he was one of five high school coaches selected as “Coach of the Year” by the Detroit Free Press. At that time, his coaching experience was centered largely around football, although his junior varsity roundball team at Evart rang up 36 straight wins. 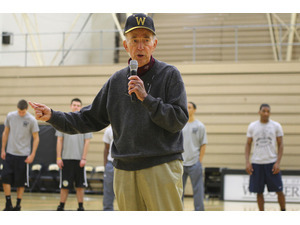 Al returned to The College of Wooster in 1960 as offensive line coach, freshman basketball coach and assistant in track. The following year, head cage coach Jim Ewers suddenly moved to Akron, and Van Wie was tabbed to fill the vacancy. He read everything he could about the game’s strategy, attended clinics, and rapidly developed the reputation as one of the game’s most diligent students. He soon demonstrated that he was also one of the court’s better tutors. Although the Scots were not blessed by an over-abundance of talent during much of the 1960’s, Van Wie developed a ball-control offense which kept Wooster in most games. Al proved his versatility a few years later when he went to a wide-open, fast-breaking attack which featured All-American Tom Dinger. The 1970-71 team went 23-1 during regular season play, including 19 successive wins. He went on to other hardwood triumphs, winning the Ohio Conference title in 1973, and bowing out as head coach following the 1982 season. In all, he won 304 games, second only to Mose Hole (412) in OAC history. Among his teams were four which won 20 or more games and three which participated in NCAA post-season play. In addition, he coached the Scot tennis teams for 13 years where he compiled an impressive .669 winning percentage. But that is only part of the story. Since 1975, he has been the men’s athletic director and chairman of the Department of Physical Education. He has served as a member of the prestigious NCAA Basketball Rules Committee and the Officials Committee of the American Basketball Coaches association. He established Camp Fighting Scot in 1970, which brings hundreds of young athletes to the Wooster campus every summer. He helped to found the Downtown Rebounders, a highly successful basketball boosters club. He has also given generously of his tie to a number of civic and community projects. Van Wie is married to the former Judy Tilford. They are the parents of four adult children. Although the Dutchman is renowned for his work on the hardwoods, he is really a man for all seasons.